Decades ago, I was participating in an all-night prayer meeting bombarding the gates of heaven. I remember beating the wall and yelling, "God, if You loved the people in Arlington, Texas, half as much as I do, we'd have revival!" Immediately, my lightning-fast mind realized that something was seriously wrong with my theology. What was I thinking? The things the Lord has revealed to me about prayer since then have totally changed my life, and I'm now seeing miraculous results. If you aren't getting the results you know the Lord wants you to have, maybe it's time to consider a better way to pray. I'm not saying that anyone who doesn't pray as I do is "of the devil." I wasn't "of the devil" in the way I used to pray. I loved God with all my heart, and the Lord loved me. But the results weren't there. First, we need to recognize that God isn't angry at mankind anymore. He is no longer imputing or holding our sins against us. We are NOW reconciled to God through Jesus. That means we are in harmony and are friendly with God right now. He isn't mad; He's not even in a bad mood. The war between God and man is over. That's what the angels proclaimed at the birth of Jesus. These angels weren't saying that peace would reign on earth and that wars between people would cease. That certainly hasn't happened. They were proclaiming the end of war between God and man. Jesus paid a price that was infinitely greater than the sins of the whole human race. God's wrath and justice have been satisfied. Jesus changed everything. God isn't angry. His mercy extends to all people. He loves the world--not just the church--but the whole world. He paid for all sin. In the Old Testament, God's judgment was poured out on both individuals and nations. In the New Testament, God's judgment was poured out on Jesus. That is the nearly-too-good-to-be-true news of the Gospel. We no longer get what we deserve; we get what Jesus paid the price for, if we will only believe. Before I understood this, I would say, "If God doesn't judge America, He will have to apologize to Sodom and Gomorrah." Now I say, "If God judges America, He will have to apologize to Jesus." Understanding what Jesus did completely changes our perspective. Moses actually told God, "Repent!" What nerve! What's more amazing is that God repented. From these and other stories in the Old Testament, modern-day "intercessors" believe we, too, must stand in the gap, or mediate, between God and man. Just as I did decades ago, they believe we must plead with God to save the lost, to withhold His wrath from those He is ready to judge, and to be merciful to those whose needs He is unwilling to meet because of their unworthiness. That couldn't be further from the truth, but it is what's being taught in many churches today. It ignores the fact that Jesus is now seated at the right hand of the Father (Heb. 10:12), ever making intercession for us (Heb. 7:25). If Moses or Abraham could persuade God, don't you think Jesus could do at least as well? In the New Covenant, Jesus is the ONLY mediator needed to stand between God the Father and mankind. Sin is no longer a problem with God; it's been atoned for, and we are now the righteousness of God in Christ Jesus. That is how God sees us. If we understand that, it will change the way we pray. It was appropriate for Abraham and Moses to pray as they did because God's wrath had not yet been appeased through Jesus. Today, under the New Covenant, if people try to mediate in that way, they are actually antichrist-against Christ. They are saying that Jesus was not enough and are not esteeming what Christ has done. When Jesus became our Mediator, He put all other mediators out of business--forever. I know these words are strong, but they are the truth. Satan is behind much of the wrong teaching on "prayer." Consider how crafty his plan is and the fruit it produces. He has convinced believers to stay in their closets, taking the place of Jesus in intercession. They spend hours pleading with God to turn from His wrath, to pour out His Spirit, and to meet the needs of the people. Meanwhile, families, coworkers, and neighbours are going to hell and dying from disease. The Bible doesn't say that salvation comes through intercession but by the foolishness of preaching (1 Cor. 1:21). And we are not told to pray for the sick but to heal the sick (Matt. 10:8) by commanding healing into their broken bodies. We have been deceived into believing prayer is all about persuading God to release His power. We believe that He can save, heal, and deliver but that He is waiting on us to shape up and earn it. The truth is, we don't deserve it, and we will never be good enough. Because of Jesus, all that God has is ours. That's good news. We no longer need to beg or plead; we need to exercise the authority He has given us and receive His blessings. There really is a better way to pray. I am not saying it's the only way, but it is working for me. 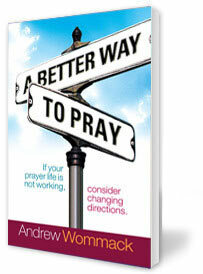 I have only touched on this subject in this letter, so I encourage you to order my book, A Better Way to Pray. This message is also available as a study guide and as CD and DVD series. In these teachings, I talk about the primary purpose of prayer; the importance of speaking to your mountain about God, not to God about your mountain; and the process of prayer. I also reveal many of the misconceptions about prayer. These truths have changed the way I pray and the results I get. More importantly, I believe they could revolutionize the body of Christ. I pray that you will take advantage of these truths and help me share them with others.